The festival of Mahashivaratri is the most important festival for the millions of devotees of Lord Shiva. It is believed that a devotee who performs sincere worship of Lord Shiva on the auspicious day of Shivaratri is absolved of sins and attains moksha. According to sacred scriptures, ritual worship of Lord Shiva on Shivaratri festival that falls on the 14th day of the dark fortnight in the month of Phalgun pleases Lord Shiva the most. There are different legends of why Shivaratri is celebrated. The most popular belief is that of the samudra manthan. When the ocean was churned for the nectar of immortality poison (haalaa-hala) was also formed. Lord Shiva drank the poison to avoid its impact to other beings. It was held in his throat and was also advised not to sleep at night lest it gets into his full blood stream. This is why the night of Shivaratri devotees don’t sleep. The next day Dhanvantari the divine physician arrived with nectar of immortality. Dedicated to Lord Shiva and Goddess Parvati, Bhoga Nandeeshwara Temple is the oldest temple in Karnataka. This temple is in the foot of Nandi hills, within the temple precincts are three other temples including the Arunachaleshwara, the Uma Maheshwara and the Bhoga Nandeeshwara. Each of these temples has its own mythological significance. Traditionally Arunachaleshwara is said to represent the childhood of Shiva, Bhoga Nandeeshwara his youth, and Yoga Nandeeshwara on the hill top, his final renunciation stage. The representation of the youthful phase of Lord Shiva is of special significance for the Bhoga Nandeeshwara Temple . The best time to visit this temple is during Mahashivarathri. Our Project Belmont is located wtihing 2 km distance of the temple. The wellness retreat of Arya Vaidya Pharmacy will have the deity of Dhanvantari, the physician god. This year Mahashivarathri is celebrated on 07th March. Six months ago we had the good opportunity of meeting a certain Mr. KKji (Mr. P. R. Krishnakumar) of the Arya Vaidya Pharmacy. What was supposed to be a 10 minute courtesy meeting turned into an hour long conversation about health, wellness, acceptance of Ayurveda in some of the most unbelievable places, Pakistan for one, etc. This paved the way for our partnership with AVP to set up a wellness centre at Belmont. The more we interacted, more we learned about the Arya Vaidya Pharmacy. We were humbled to know that this was a Century old company offering world class healthcare, wellness and many times saving lives and providing palliative care all through Ayurveda. The process and the reputation helped them collaborate with WHO and UCLA Medical School. “Brand building is a matter of trust, high degree of recall and consistency,” in the Pharma Industry says Sujay Shetty, Partner, PricewaterhouseCoopers. 10 Reasons why you need a home near the Hills! A sudden halt and the kids jump off the car , running to their holiday home , by the window, looking at the serene hills and then a montage of a happy family with children and grandparents playing on swings, a jumpy canine running amidst the woods and parents overlooking all of this acknowledging their accomplishments. We usually see all of this in mutual fund or life insurance advertisements between prime time television shows. But has the importance of a holiday home near the hills ever crossed your mind? Here’s why a holiday home amidst the hills could actually be a good buy! 1.Undoubtedly, it’s a perfect place to sit back and relax while you watch your kids frolic to the tunes of nature and not to some bollywood song. 2. With all the massive structures in the city, it’s quite impossible to get a glimpse of the sun. Watch the sunrise or sunset without letting silly concrete walls from blocking your view . 3.It’s definitely that break you need from the honk- bonk city. 4.You really need to get your children off their digital tablets and computers in order to give them a whiff of the real joys of life. 5. Of course, the air is much more breathe- friendly. 6. The birds don’t come chirping to your apartment in the 14th floor anymore. Well, nature is home to many exotic birds and the chances are you would actually wake up to symphonic tweeting. The real kind of tweet! 7.Nature has a mysterious way of healing you from physical and mental stress. Nothing is more relieving than looking at a lot of green and cherishing Mother Nature’s love for you! 8.Look out for a mild terrain and go for a trek! Let night drives not be the only adventure for your kids. 9.Fruits grow abundantly in the surroundings of hills and fruit plucking is a fun activity too. Let your kids know the difference between an organic fruit and a fruit from the grocery store. 10. Several green patches in the city are being replaced by apartments and commercial buildings. The fact that you still have a home amidst nature is definitely a relief. So no matter how much your city is being filled up with concrete, you still have your sweet escape. Looking for Weekend homes in Bengaluru? The Bangalore city madness has been pulsating rapidly and weekend homes have been trending amongst Bangalore city folk .Several real estate companies have detected potential at the outskirts, especially the Nandi region. Deriving from the efforts of an efficient team at Citrus Ventures, we have acquired one of the best spots at the foothills of Nandi. The plot is strategically located away from the bustling city but, in city limits. The relocation of the international airport has boosted the connectivity to the city and has resulted in ease of access to any location in Bangalore, while being right next to the serene Nandi hills. 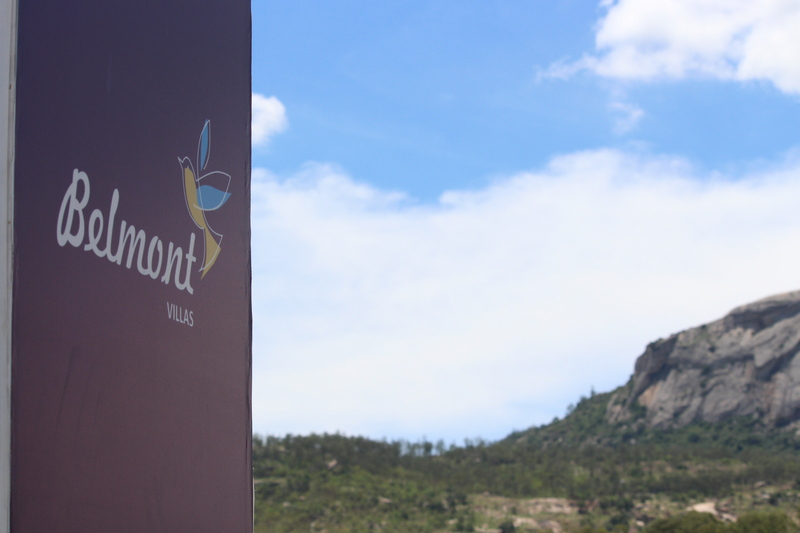 Belmont is an expansive development of weekend villas at Nandi foothills. It is 20 kms north from the International airport, making Belmont the ideal place for a perfect escape from the hysterical city rush.To make things better, the project is just 5 minutes drive away from an 18 hole GPA approved golf course. Belmont is not simply the best in the league for its location .It offers several amenities that include: Modern club house, swimming pool, toddlers pool, senior citizen gazebo, commercial shopping area, gym, basket ball court, kids play area, tennis court, indoor badminton court, joggers park, park area, underground power cables, black top reads, closed drain system, amphitheatre, meditation area, security kiosk, water body, reflexology garden, party lawn, practice cricket net and a giant chess. The price of these villas start at 66.5 lakhs and also offers attractive rental returns. 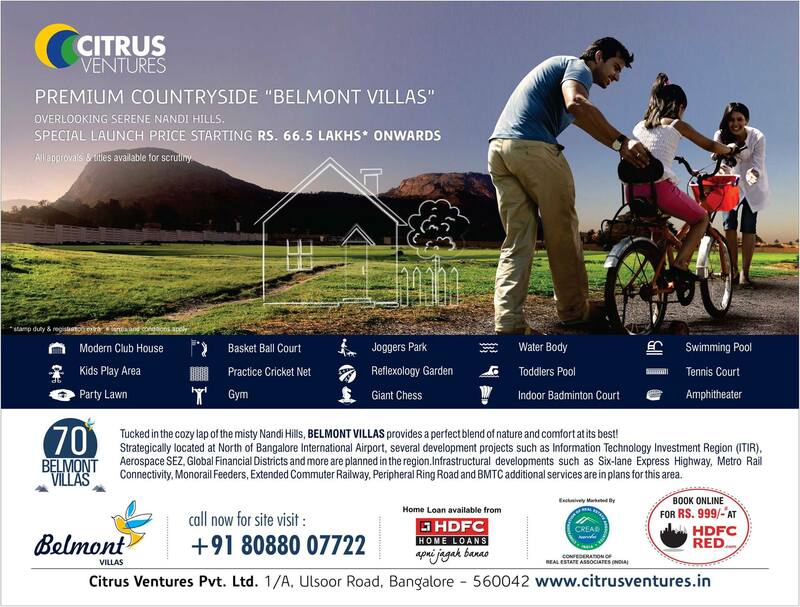 Owned and run by a team of professionals, Citrus Ventures is a four year old real estate developing company to design and build your dream home. We have a bouquet of options to invest, starting from plots, apartments and weekend homes to premium villas. Whatever your budget, we can serve you!